This new, ultra-sheer, iron-on adhesive comes in pre-cut 8.5" x 11" sheets to print or copy on your inkjet printer. Features quick, easy release paper liner - no more picking at the edges of your applique! 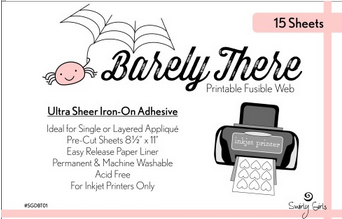 Barely There is permanent, machine washable and acid free. Perfect for layered applique!